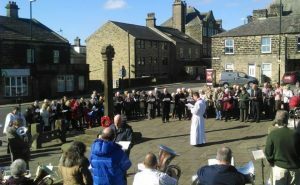 Join us on Sunday this as we start Holy Week with the traditional Palm Sunday procession from the cross in Towngate in Guiseley. Starting at 9.30am, Palm crosses will be given out, and the procession moves to St Oswald’s Church, led by the clergy and choir. At 6pm join us for a Lenten Meditation in Church. Readings and music from the Choir of St Oswald’s Guiseley – all welcome!